Chosen as the Forces War Records' June 2017 Book Of The Month! You'll be £5.20 closer to your next £10.00 credit when you purchase All Quiet on the Home Front. What's this? The truth about the sacrifice and suffering on the home front during World War I is rarely discussed. In this book, some of the oldest men and women in the country speak about experiences and events that have remained buried for 85 years. Their testimony shows the same candour and courage we have become accustomed to hearing from veterans of the western front. Those interviewed include a survivor of a Zeppelin raid on Hull in 1915, a Welsh munitions worker recruited as a girl, and a woman rescued from a bombed school after five days. There are also accounts of rural famine, bereavement and the effects on families back home, and even the story of a woman who planned to kill her family to save them further suffering. This book covers every aspect of social history and the effects military decisions had on citizens back home. The line "At 11am on the 11th of November 1918 the country went wild with joy" in the final chapter sums up the spirit of all the contributors. 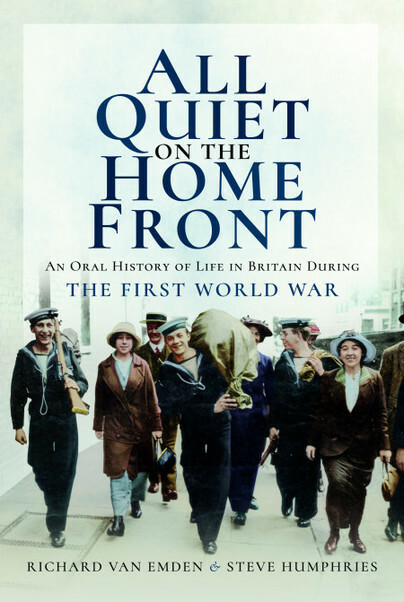 By bringing in such wide aspects of the home front, this book provides a crucial reflection of the wider impact of war to people at home and , in turn gives us a scurf all social canvas Britain at the time. The text is also complimented by a fascinating photo section, including people cheering upon Britain's entry to war, bombed Whitby, workers in munition works, the impact of rationing, as well as key people which the book provided focus on. One particularly striking photograph is that of a farm boy with horses and plough, standing in silence in Remembrance during the two minutes silence. A poignant section on the 'Bittersweet Victory' reminds the reader that commemoration of the War was egalitarian. At every level, from the former Prime Minister's son downwards, 'men had been killed'. If you are looking for one book for your bookshelf which will give you a wide overview of the experience Britain had during this time, brining in contemporary research, this is an excellent purchase. The home front in WW2 is immortalised forever in Dads' Army - nothing similar for WW1, and yet the people left behind faced even bigger challenges, especially when so many men failed to return home after the hostilities. Noted WW1 historian sets the records straight in this fascinating account of what went on back home.